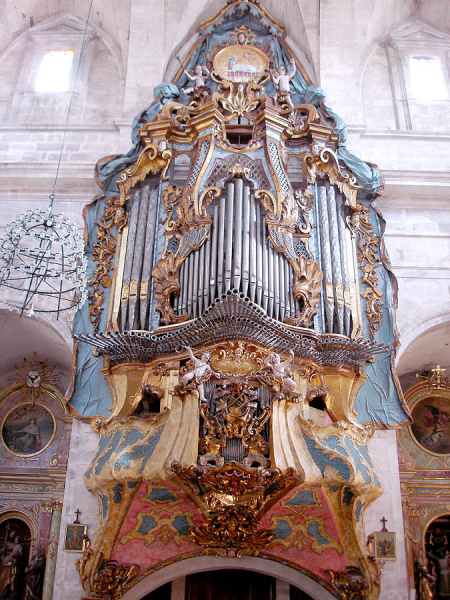 The Santanyi organ was one of his first works. 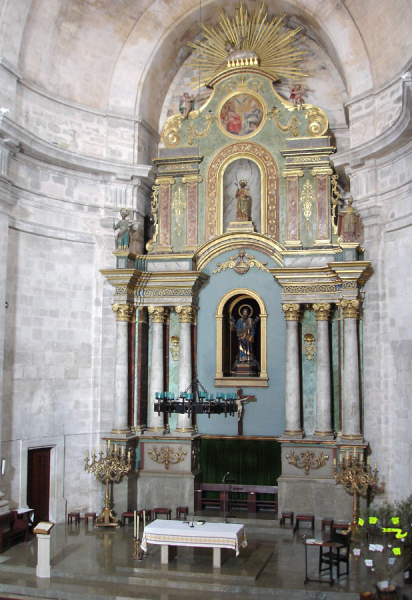 He built it at the age of 26 for the monastery of Santo Domingo in Palma. 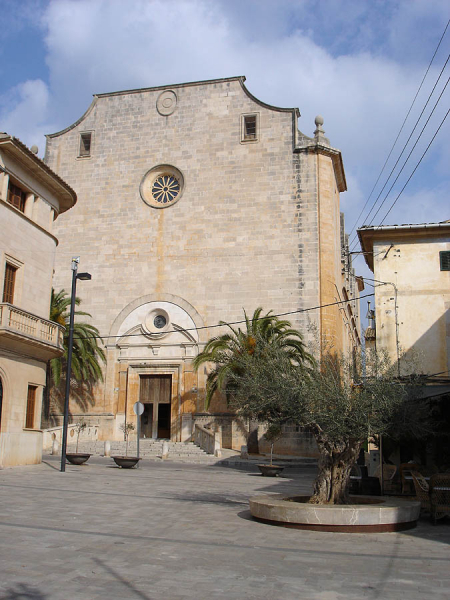 After the Dominican monastery was abolished in 1837 the organ was translated to Santanyi. 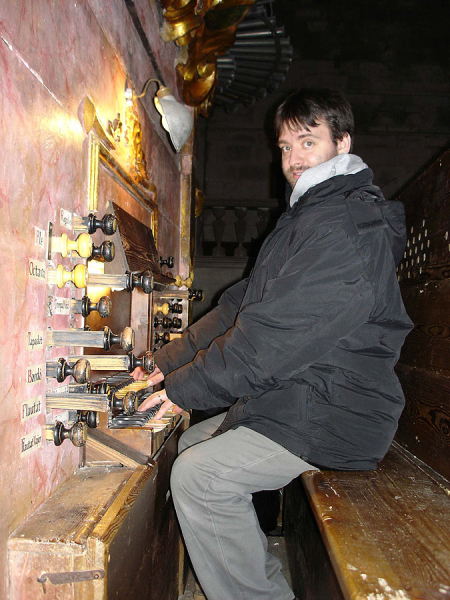 Because the church was smaller than the St. Domingo the organ was reassembled by Guillem Puig only partially. Later visitors of Santanyi claim that "the pipes and trumpets were lying in corridors and elsewhere". Only in 1873 the Cadireta was reinstalled. 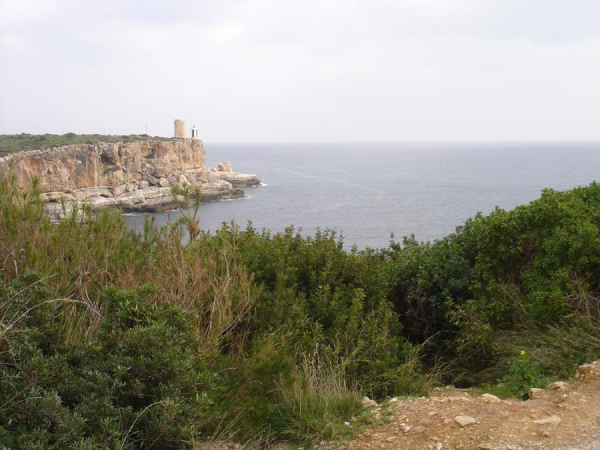 In the 1888 the great Corneta was installed. But the organ was still only partially functioning since in 1932 an article appeared in a local newspaper describing the deplorable state of the instrument. The visiting organist reports that not all the stops were present and that there were old labels on the stop jambs reminding of past drawstops which were no longer there, only holes remained. From his report we also know that most probably the organ had originally three manuals. Unfortunately, his report is a bit confused at this point and no further specifications are given. 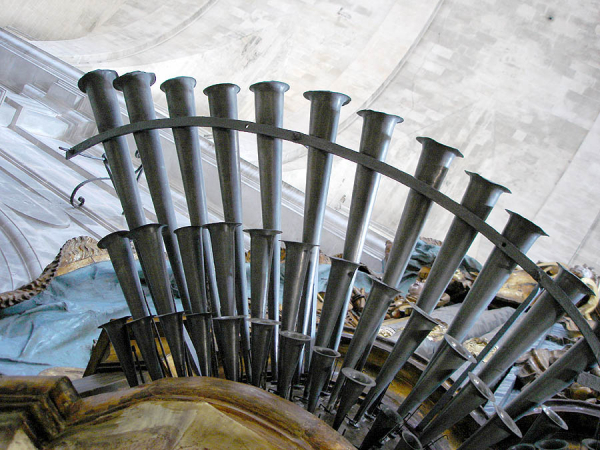 In 1957 the organ underwent further alterations (pneumatic action introduced and some new stops). The organ was carefully restored by Gerhard Grenzig in 1984-6. His report about J. Bosch is available on-line. At the end of the article there is even the composition of the 25 rank mixture listed in a table. 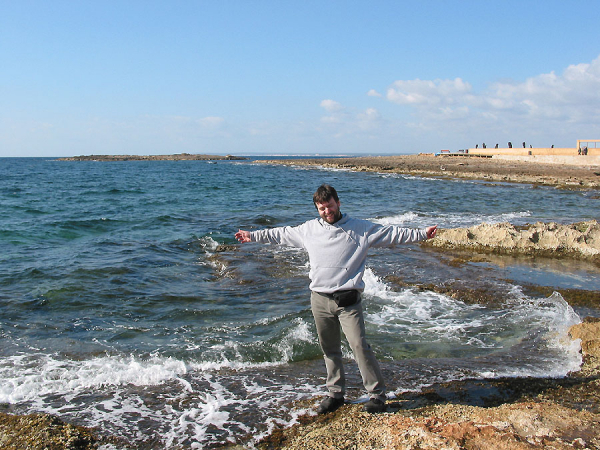 (I am indebted to Dr. Stuart Frankel for the link and for some other details. You should consider reading his article on the historical registration on the Santanyi organ, listed below!). 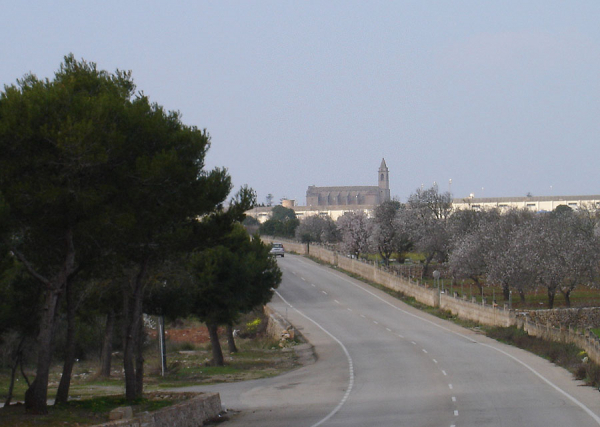 Special thanks to the authorities of the Santanyi parish of St. Andreu, especially to Don Sebastia Salom who gave us tremendous and enthusiastic support during the recording process! 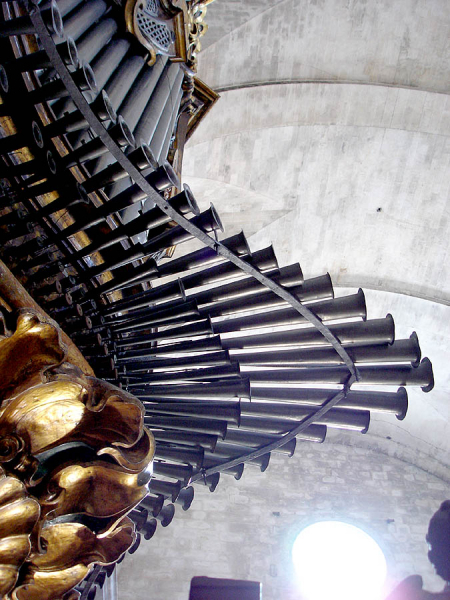 Stuart Frankel: A few notes about historical registration on the Santanyí organ, available on-line. 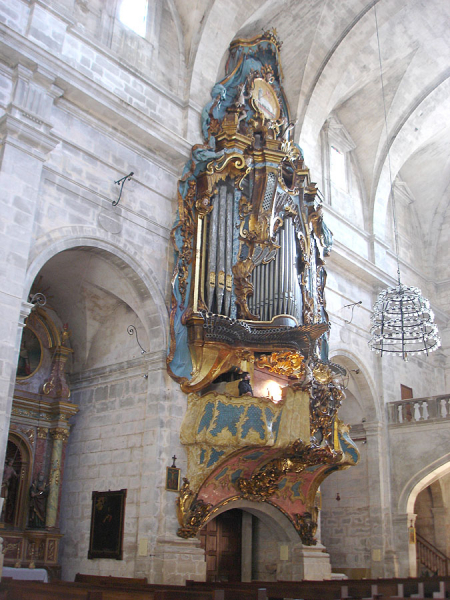 Gerhard Grenzig: The monumental organ of Jordi Bosch in Santanyi. A booklet accompanying the 3rd CD from the series "The Historical Spanish Organ", published in 1992. Antoni Mulet, Arnau Reynés, fotografies de Justo González: Orgues de Mallorca. 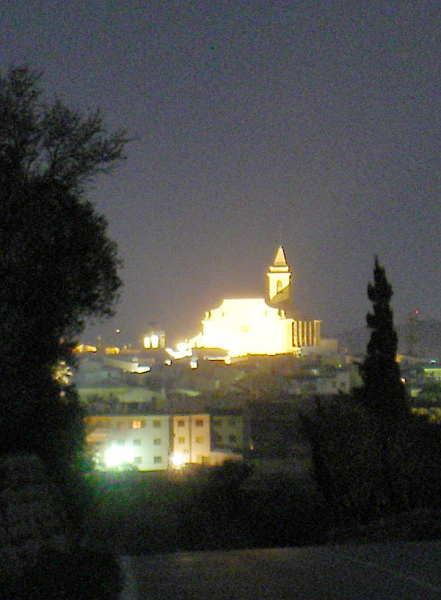 Palma de Mallorca: Olańeta, . 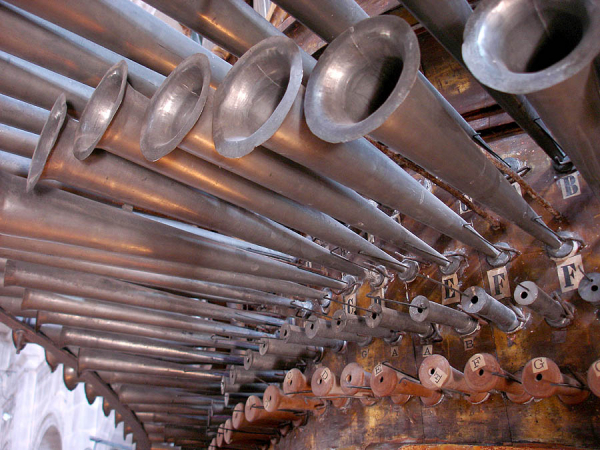 A 2 manual organ of the Spanish type with the characteristic Trompeteria consisting of ranks of horizontal trumpets. The reverberation time is 4-5 s.
The noise samples (tracker action, blower noise, stop action noise) are included but can be disabled by the user. Combination pistons (not originally present) were added digitally to facilitate the performance. The samples are available in 24 bit / 48kHz depth but may be loaded to Hauptwerk at 16 bit to save RAM. There are three levels of reverb tails - staccato, portato, long for optimal performance. The short releases courtesy of Al Morse. Initial chiff of pipes may be controlled via MIDI velocity sensitive keyboard. User adjustable per stop voicing available. Requires 1280x1024 px screen resolution. Single console, as well as dual stop jambs are available. The stops are positioned exactly as on the original console (including the various style drawknobs). However, the Pedal Contres drawstop was added for the ease of use of the Organ Model; originally this stop is always on without having a visible drawstop. 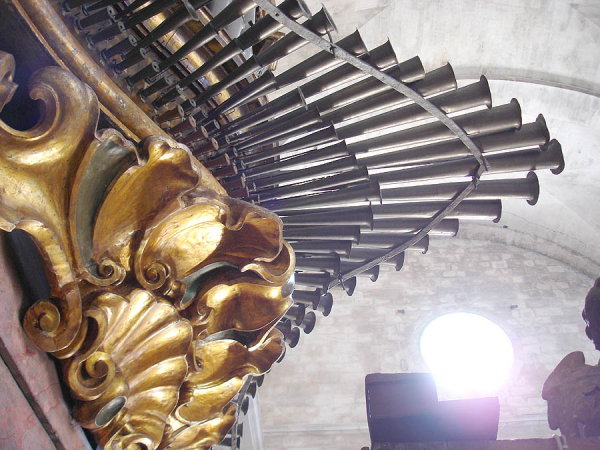 For more details about the stops available, you should consider reading the article on the historical registration on the Santanyi organ. The organ has 2 manuals of 48 keys. The low C# is missing but was added digitally, so the Hauptwerk version has 4 full octaves - 49 keys. The pedal has 10 buttons, two of which are dedicated to "Terratremol" - a subtonic beating sound. These occupy the leftmost and the rightmost buttons. The 8 buttons in between these two extremems form the diatonic scale of the pedal keys, i.e. C - D - E - F - G - A - Bb - B. The adaptation to a modern pedalboard was solved by shifting the pedal compass to the middle pedal octave. Therefore, the low Teratremol is positioned on the lowest B key of the modern MIDI pedalboard (MIDI tone 047); the mid c key (MIDI 048) is the C key of the pedal compass etc. With the help of Hauptwerk native functions you can adjust many features of the instrument: volume, tuning, amount of reverberation, wind fluctuation, memory consumption by loading only a subset, bit depth and many others. 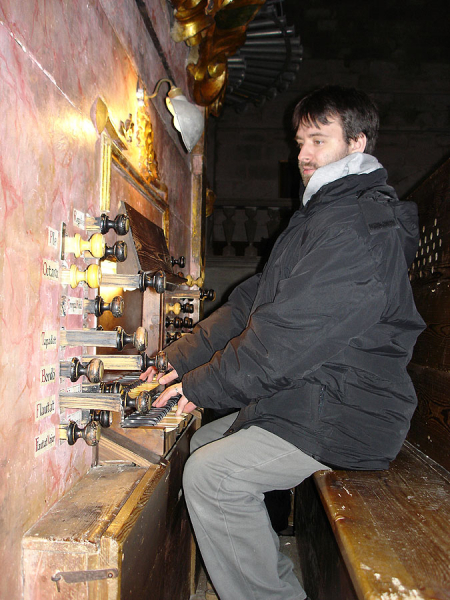 In addition, Santanyi organ has a complex photorealistic interface giving to you full controll over the organ. Click on the images to learn more. Terratrèmol - the pedal beating stop. Several Contres pipes sounding simultaneously producing an "earthquake" effect.